Optical filters are generally used to selectively transmit or reject a narrow wavelength band or a range of wavelengths. 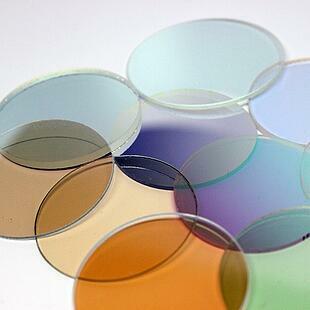 VisiMax can provide a variety of optical light filters; one area of application is filter coatings. VisiMax Process Color Filters selectively and accurately pass the light of a small range of colors while reflecting other colors. Our heat-resistant dichroic filter coating technology produces durable interference filters that render light with precise spectral control. Advances in lower-energy lighting such as LED may lead to additional design challenges. For example, unfiltered LED light is sometimes bright, brash, “hot,” and potentially unsightly. These circumstances are not ideal for applications and environments involving people, certain architectural designs, or artwork. VisiMax Process Color Filters for lighting can adjust the color temperature in several lighting applications by modifying the LED spectral output designation. This makes the lighting appear more like tungsten lighting or halogen lighting and improves aesthetic appearances in a variety of environments. Depending on the application or design requirements, several types of filtered light may be desirable. Soft or warm light is typically provided by red or orange filtration, while cool light is provided by blue filtration. Previously used low-coat methods of dipping filters into dyes and covering the light source are effective but not necessarily appropriate for a high-value lighting application. In a dye-based process, continuous heat as well as extended temperature cycling can degrade and fade dyes over time, reducing the color filtration effect. VisiMax dielectric filter coatings will last much longer than dyed filters. Contact our skilled design team to discuss a custom filter to meet your specific requirements today. Have a question about coatings?